The University of Granada (Spanish: Universidad de Granada, UGR) is a public university located in the city of Granada, Spain, and founded in 1531 by Emperor Charles V. With approximately 80,000 students, it is the fourth largest university in Spain. Apart from the city of Granada, UGR also has campuses in Northern Africa (Ceuta and Melilla). In the academic year 2012/2013 almost 2,000 European students were enrolled in UGR through the Erasmus Programme, making it the most popular European destination. The university's Center for Modern Languages (CLM) receives over 10,000 international students each year. In 2014, UGR was voted the best Spanish university by international students. In 1526 a college was founded in Granada by Holy Roman Emperor Charles V for the teaching of logic, philosophy, theology and canon law. On 14 July 1531, the establishment of a studium generale with the faculties of theology, arts and canon law was granted by a papal bull by Clement VII, marking the birth hour of the university. The university has an important heritage thanks to its policy of using buildings of historical and cultural value such as the former madrasah and the former Royal Hospital of Granada. Furthermore, the university has major new facilities committed to innovation, such as the Parque Tecnológico de Ciencias de la Salud. According to several rankings, the University of Granada ranks among top ten best Spanish universities and holds first place in Translation and Interpreting studies. It is also considered the national leader in Computer Science Engineering. UGR also plays a major role in scientific output, placing high in national ranks and being one of the best world universities in computing and mathematics studies. UGR is composed of 5 Schools, 22 Faculties and 116 Departments responsible for teaching and researching into specific subject areas. They are spread over five different campuses in the city of Granada (Centro, Cartuja, Fuentenueva, Aynadamar and Ciencias de la Salud), plus two more campuses located in the cities of Ceuta and Melilla, Spanish territories in Northern Africa. The University of Granada also offers a wide range of postgraduate programmes (Master's Degrees, Doctorate Programmes and UGR's Postgraduate studies), made up of studies adapted to the European model. The UGR began admitting international students in 1992 with the founding of the School for Languages (Centro de Lenguas Modernas). As of 2009-2010, there were some 5,000 international students, including Erasmus programme exchange students from the European Union. The CLM has agreements with 20 universities and study abroad organizations in the U.S. and in Canada in order to bring North Americans to the UGR, including the American Institute For Foreign Study, Arcadia University, International Studies Abroad and the University of Delaware. Francisco de Paula Martínez de la Rosa, Spanish statesman and dramatist. Julián Sanz del Río, philosopher, jurist, and educator. He brought Kraussism to Spain. Pedro Antonio de Alarcón y Ariza, novelist, journalist, and politician. Manuel Gómez-Moreno Martínez, archeologist, and historian. Francisco Javier Simonet y Baca, orientalist, Arabist, and historian. Federico Olóriz Aguilera, doctor, anthropologist, and criminologist. Angel Ganivet, Spanish writer precursor to the Generation of '98 and ambassador in Helsinki. Melchor Almagro San Martín, writer, diplomat, and politician. Francisco Villaespesa Martín, modernist poet. Alejandro Sawa, bohemian, and writer. Melchor Fernández Almagro, literary critic, historian, journalist, and politician. José Fernández Montesinos, literary critic, and University professor. Américo Castro, cultural and intellectual historian, literary critic, and University professor. Juan Francisco Casas, Spanish artist. José de Salamanca, Marquis of Salamanca, Spanish businessman and politician. Juan Carlos Rodríguez Gómez, literary theorist, literary critic, and University professor. Antonio Carvajal Milena, poet, and University professor. Andrés Neuman, Spanish-Argentine writer, and journalist. ^ "Estadística de la Enseñanza Universitaria en España" (PDF). www.ine.es. Retrieved 2015-04-29. ^ "¿Cuáles son los destinos de Erasmus más populares?". La Vanguardia. Retrieved 2018-03-05. ^ "University of Granada, GRANADA, SPAIN, Ranking, Reviews, MBA, Master, Courses". Retrieved 23 July 2015. ^ Europa Press (10 January 2014). "La Universidad de Granada, la mejor de España por los estudiantes internacionales". europapress.es. Retrieved 23 July 2015. ^ "La UGR se distancia de Sevilla y adelanta a Córdoba en excelencia". Retrieved 23 July 2015. ^ "University of Granada". Retrieved 23 July 2015. ^ "University of Granada". Archived from the original on 2012-02-03. Retrieved 23 July 2015. ^ "Collaborating institutions and study abroad programs". Archived from the original on 2013-12-24. Retrieved 23 July 2015. 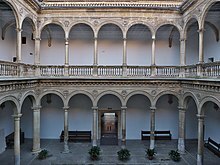 Wikimedia Commons has media related to University of Granada.